Leaders of the L.A. County Metropolitan Transportation Authority (Metro) today joined federal, state and local elected officials in the Mid-Wilshire District of Los Angeles to break ground on the long awaited Metro Purple Line Extension Project, the largest, most ambitious public works project in the Western United States. In July, Metro’s Board of Directors approved a contract with Skanska, Traylor and Shea (STS), a Joint Venture, to construct the Purple Line Extension Project. Construction of the subway extension will connect West Los Angeles to the region’s growing rail network, making it possible to travel between Downtown Los Angeles and Westwood in 25 minutes. The first subway segment will extend the Purple Line 3.9 miles from the existing Wilshile/Western Purple Line terminus near Koreatown into Beverly Hills. Three new underground stations are planned at Wilshire/La Brea, Wilshire/Fairfax and Wilshire/La Cienega, providing fast, frequent, high-capacity transit service farther west along busy Wilshire Boulevard. The Purple Line Extension is a critically important rail project that is partially funded by the 2008 Measure R sales tax that was overwhelmingly approved by two-thirds of L.A. County voters. The first segment of the subway is expected to be completed in 2023 with a project budget of $2.821 billion. In addition to this local funding, Metro received a $1.25 billion Full Funding Grant Agreement (FFGA) from the Federal Transit Administration to help pay for the first segment. 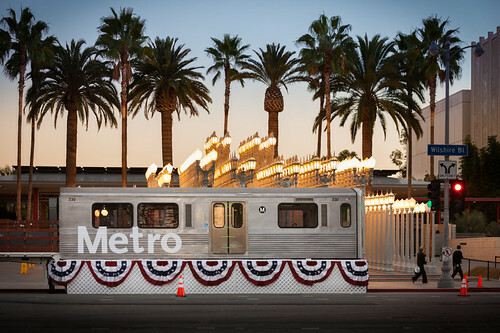 The U.S. Department of Transportation also granted Metro a low-interest loan of $856 million from a Transportation Infrastructure Finance and Innovation Act (TIFIA) to complete the funding package for the project’s first phase. Combined, these nearly $2 billion in project commitments represent the biggest federal transportation investment for a single construction segment in the history of Los Angeles County. The remaining $821 million in project funding for the first segment includes Measure R, City of Los Angeles local funding, and other existing local and federal funds. The project is planned to be built in three sections. Section 2, which will include Wilshire/Rodeo and Century City stations, is scheduled for completion in 2026. Section 3, which will include Westwood/UCLA and Westwood/VA Hospital stations, is planned to open in 2035. When all three project sectionss are complete, the Purple Line will extend westward from Wilshire/Western for nearly nine miles with a total of seven new stations. Metro is currently seeking additional federal funding that could accelerate subway construction for Section 2 in the form of a $1.1 billion grant from the federal New Starts program, and a $307 million low-interest loan from the federal TIFIA program. The full nine-mile project is projected to generate about 62,000 daily weekday boardings at the seven new stations. Today, there are 39,000 daily boardings on the Purple Line between Union Station and Wilshire/Western. By 2040, 150,000 daily boardings are expected on the Purple Line between Union Station and Westwood/VA Hospital. During peak periods, trains are expected to run every four minutes. During off-peak periods, they are expected to run every 10 minutes. It will also create tens of thousands of jobs and generate increased economic activity for the region. Over 300,000 people travel into the Westside every day for work from throughout the region. More than 100,000 people leave the area for outside destinations. These numbers will increase over time. The Purple Line is expected to provide a much needed transit alternative for traveling to and from West Los Angeles, one of the county’s most densely populated, job-rich areas. The area is also home to major world-class destinations. The subway extension is expected to reduce reliance on automobiles, help reduce roadway congestion, reduce travel times and reduce greenhouse gases. The Purple Line extension also will offer improved connectivity to the entire Metro Bus and Rail network, as well as municipal bus lines and other regional transportation services. It is just one of several projects designed to improve transit options and mobility in the area. Other planned improvements include the Wilshire Bus Rapid Transit Project and Expo Phase II line to Santa Monica.